A good multimedia setup needs a good set of speakers, especially if one is trying to build a home-theatre system. To make for complete multimedia experiences with complete surround audio, a powerful and capable multi-speaker setup is essential. 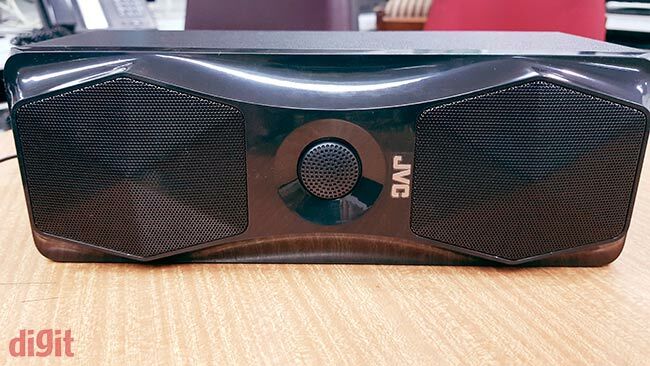 However, with the rise of portable and single-unit speakers, it is not often that we get our hands on a 5.1 speakers set up at the Digit Labs. So, when the JVC XS-XN511A showed up at our office, we were definitely intrigued by how much of sense would such 5.1-channel systems still make in terms of the experience and the overall value. 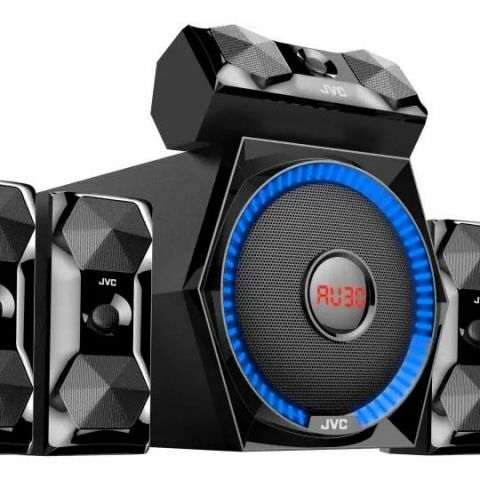 As one would expect, the JVC 5.1 speaker setup comes with a subwoofer and a set of satellite speakers. The entire setup is built of hardened plastic and sports a sandblasted finish on most of the external surfaces. The plastic used for the build feels quite cheap and tacky and does not feel durable at all. The same can be said for the grilles on the speaker outputs. In fact, one of the satellite units came damaged out of the box, even though everything was packaged pretty well in thermocol. The woofer, with a 6.5-inch 50W driver powering it, has a hexagonal front face with a circular array of LEDs in circumference around the woofer’s front face. At the centre of this output is a monochromic LED display that shows different information, depending on the state of the speaker (more on that later). 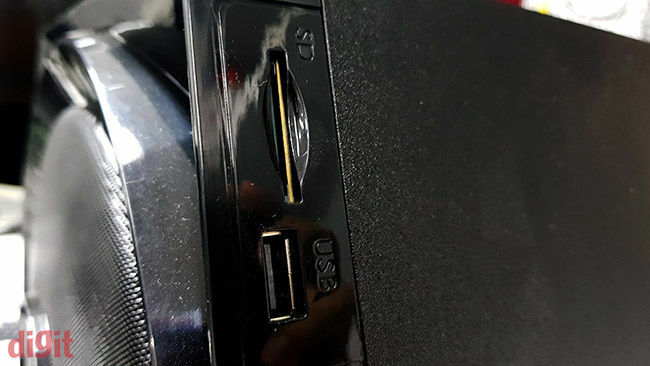 Physical buttons to control playback and navigation are located at the top of the woofer unit, and the USB and microSD ports are located to the right. With dimensions of 28 cm*29 cm*33 cm, the woofer unit should fit under most TV and computer table setups. All the audio input and output ports, along with the power switch, are located at the back of the woofer. 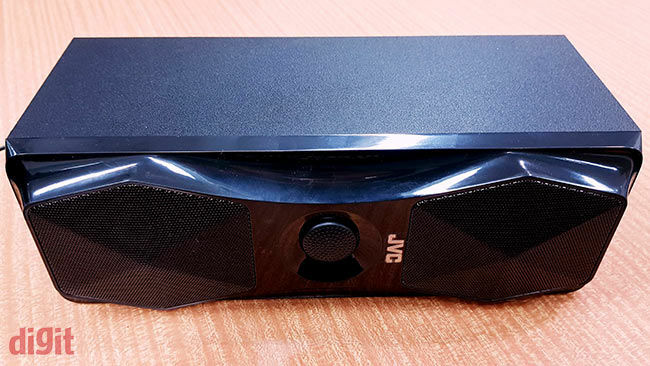 The packaging includes wires for the satellite speakers, three sets of optical cables, an aux cable, and although there is a dedicated FM antenna port, the packaging did not include an external receiver antenna. The satellite speakers, namely the FR, FL, SR, SL and CEN channels are all of the similar quality, sporting a plastic build with a sandblasted finish. They come in cuboidal shapes with the hexagonal pattern showing up again on the front around the speaker outputs. These speakers cannot be wall-mounted and will have to be placed on a surface unless you find aftermarket solutions for attaching wall-mount hooks. The remote controller included with the setup is very flimsy, especially when you consider the price of the unit. It is also important to note that for some inexplicable reason, JVC has included a whole lot of redundancy in this unit, and multiple buttons seem to do the same task. For instance, there are two sets of volume control buttons for all channels, and while there are individual buttons to quick-select an input mode, there is another ‘M’ button that scrolls through the multiple input modes, if you will. This makes the remote controller an unnecessarily cluttered unit. The wires are very thin and flimsy as well and should have been shielded better. In their current thin insulation, these wires can be very prone to tearing if you step on them a couple of times, by mistake. The JVC XS-XN511A has an adequate set of features for a 5.1-channel speaker setup, which makes it more or less capable of accommodating most input modes. This might be its biggest selling point at the 11k price point. Thanks to supporting USB and microSD playback, you can directly plug in your pen drives and memory cards, although yet again, for even more inexplicable reasons, you can only play mp3 format files through pen drives and memory cards. The system does not even support common formats like Wav, aac and the likes, which is strange given the diversity of local music files that one may have. For purists, these modes do not support FLAC and other high-resolution, lossless CD rips, thereby bringing down their usability. As mentioned earlier, you get controls on the woofer which let you switch between physical input ports and the inbuilt FM radio. There’s a port on the back to connect an external FM antenna to improve the reception, which may be necessary as in our experience, the reception from the integrated antenna is weak in an enclosed room with no open sides, which is more frequent than not in a city like Mumbai. Additionally, for some weird reason, the FM antenna port is included in the ‘output’ group of ports - which might lead to some confusion when setting it up. 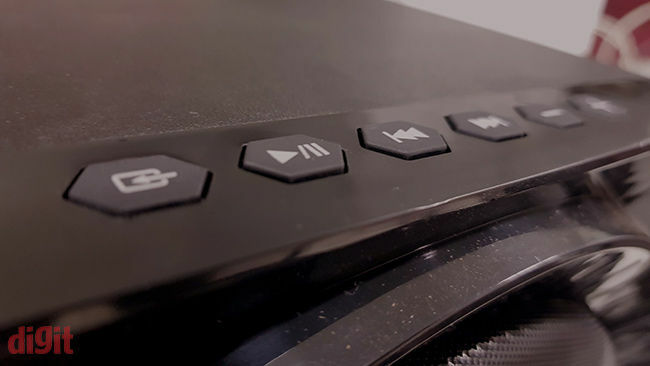 The remote controller allows you to adjust channel-wise volume levels with ease, to find the perfect balance of surround audio distribution as per your auditory preferences. The range of buttons includes playback control, volume adjustment, input mode selection, individual channel levels and subwoofer level. A singular ‘Pro’ button lets you switch between 2.1 and 5.1 output modes, and thankfully, there is support for 5.1-channel playback via Bluetooth. All of these make the JVC XN511A a rather restricted 5.1-channel speaker setup. The build quality is unimpressive and the physical input interfaces are restricted to playing only mp3 files, and its only real saving grace is 5.1-channel surround playback via Bluetooth. Apart from wirelessly connecting your phone, you will need to plug it into either a television or a DVD player, if you still happen to own (and use) one. This almost beats the purpose of owning an easy-to-setup, quick-access 5.1 speaker setup, rescued slightly by its wireless playback compatibility. The JVC XS-XN511A is powerful, but then that by itself is not a standout feature for a 5.1 setup. In the 2.1 setups, the woofer tends to overpower the front left and front right speakers even after adjusting the mean channel outputs. The speaker units are powered by 3-inch, 15W drivers. In 5.1 mode, however, the unit puts out a fairly balanced output, with all the speakers coming together to compensate for the lack of mid- and high-frequency output. Keep in mind that your listening experience will depend on the individual channel volumes you’ve set as well. We found that keeping the bass at the mid-30s (on a zero to fifty slider) gives the most satisfactory response across genres. Pushing it beyond that will make the music sound boomy in most average-sized living rooms. Also, keeping the rear channel volume levels about 8-10 points higher gives the music a boost in power and wholesomeness, without hampering the listening experience. Pushing the front speakers to such volume levels distort sound in a similar configuration. Tracks like Selkies by Between the Buried and Me sound moderately powerful. The high instrument density in the track doesn’t lose impact, although don’t expect a high degree of clarity from the listening experience. Listening to Choti si Asha from Roja, all the individual instruments in the opening part of the song sound bright and crisp and the overall experience is quite nice. There are limitations to the XS-XN511A’s performance though - pushing the upper-mids results in treble peaking, perceivable in tracks like Hello by Adele. On overall terms, the bass sounds good enough for playing action movies while set up with TVs. The bass output is also satisfyingly clear, and once you find the right balance of volume levels across all channels, the JVC XN511A can actually be a pretty decent 5.1-channel speaker setup to own. 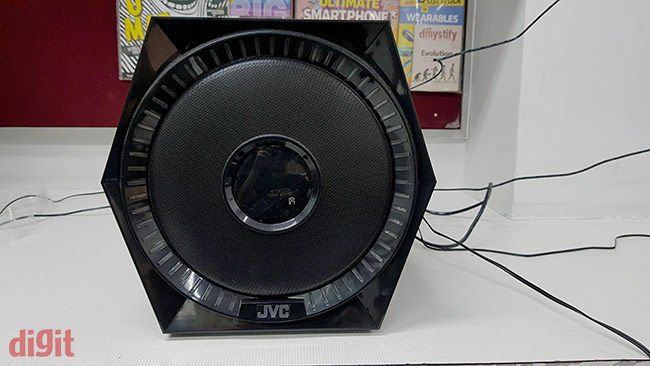 The JVC XS-XN511A, at 11,999, is a 5.1 speaker at the price of most lower-mid range smartphones these days. While certain features like wall-mounting and common file format playback are surprisingly missed, having multiple input modes on the unit itself helps make it fairly versatile. We wish that the unit used better material for the build, as the current choice makes it feel quite flimsy and might end up suffering significant damage in case of accidental falls from even modest heights. If you do get it at a discounted price in the sales coming up on various e-commerce portals, it may be a good choice for a low budget multi-speaker setup that you’ve been eyeing. Apart from this, the JVC XS-XN511A leaves you with an underwhelmed feeling despite the decent audio performance that it produces. Recommendation sought for 5.1 Speaker system under 30k ? Best home theater system under 20k with true surround sound?